Alumin-Nu | Pro Chem, Inc.
ALUMIN-NU is a safe alternative to hydrofluoric and sulfuric acids. It is not corrosive to skin, making it easy to work with. 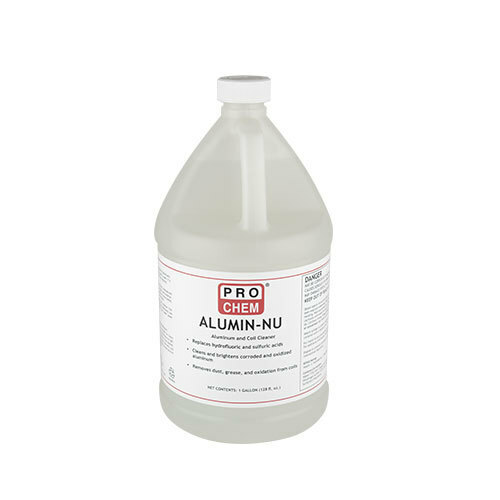 As an aluminum cleaner and brightener, ALUMIN-NU has outstanding calcium, lime scale and silicate-deposit removal properties. It quickly removes corrosion and oxidation, leaving surfaces bright and clean. It can be used on almost all aluminum. 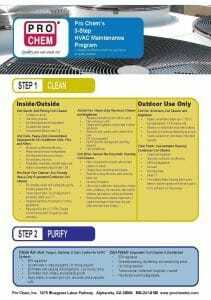 As a coil cleaner, it removes dust, dirt, grime, grease, and oxidation from aluminum or copper coils as well as fins of cooling units and air conditioners. Using ALUMIN-NU regularly to clean coils keeps your equipment running more efficiently and consuming less power. Complete directions can be found on the product label. Dilute 1 part cleaner with up to 5 parts water. Brush or swab onto surface then rinse with water. Do not use on anodized aluminum. Always test in an inconspicuous area before using.